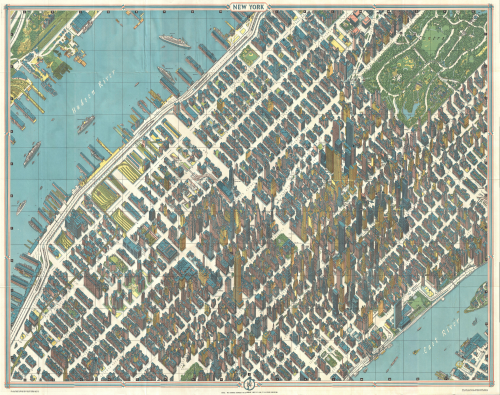 Published for the 1964 New York World’s Fair, Bollman’s map maintains scale equally throughout by an axonometric projection, a technique developed as early as the 15th Century. 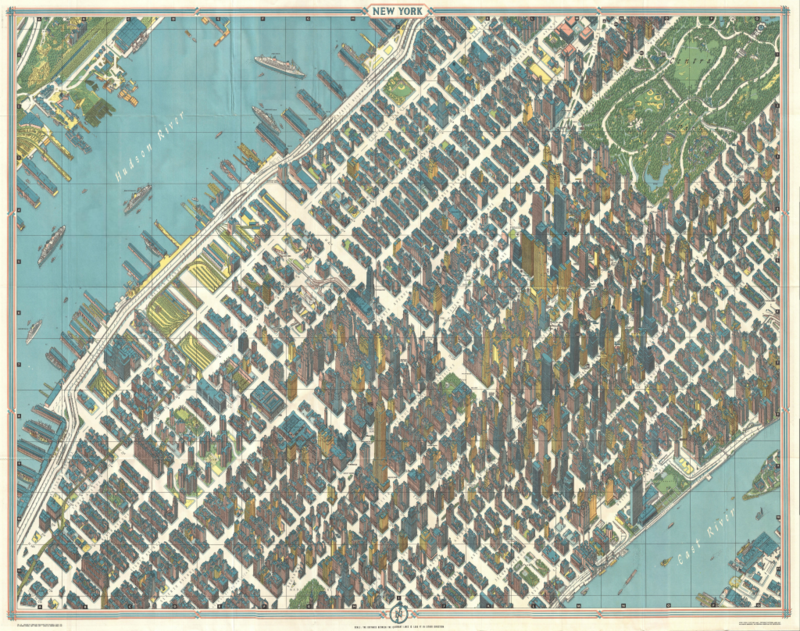 Bollmann, a woodcarver and engraver, drew this spectacularly detailed map by hand from 50,000 ground and 17,000 aerial photographs to allow readers to view all parts of the map at the same scale. The map exaggerates widths of streets to create a perfect amount of white space in which buildings sit. The dense fabric of the city is represented at the same time as giving clarity to individual buildings. Vertical exaggeration is used to give a sense of the skyscrapers soaring. The street numbering is consistently placed and beautifully letter-spaced. The rich detail invites closer inspection and the colouring, predominantly in pastel shades (to identify building function) with deep grey roof-tops mimics the grey skyline of Manhattan. Other versions exist such as Constantine Anderson’s 1985 map and Tadashi Ishihara’s version from 2000. This entry was posted in MapCarte and tagged large scale, MapCarte, projection by @kennethfield. Bookmark the permalink.